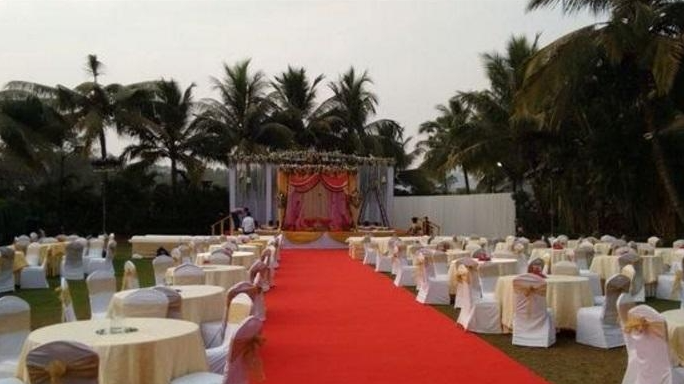 Whether you are planning to have an intimate wedding or an exorbitant one, Ramada will surely match your unique choice, budget, and requirements. With a capacity of accommodating up to 150 in seating and 1500 in floating, the venue has a cosy and comfortable interior for the guests. It also offers an in-house team of caterers that puts all the efforts to delight the guests with mouth watering multi-cuisine dishes. Nestled between the serene Powai and Vihar Lakes and surrounded by swathes of green, Ramada Powai is an oasis of calm in the chaos of Mumbai. The hotel has four plush banquet spaces — the grand, ground-level Crystal Ballroom, which can comfortably accommodate a large number of guests. When combined with the lawn, it can be divided into three sections for smaller functions. The almost-as-large Emerald Ballroom can also host an extensive guest list or be broken into smaller sub-sections; and the small but well-furnished Sapphire Ballroom is perfect for intimate functions like your mehendi or sangeet. But a large part of the hotel's clientele is drawn to the venue's vast, open spaces: the Poolside Lawn, which is set around the swimming area with a gurgling water fountain, a cabana and a breathtaking backdrop of misty hills. The Garden, a picturesque landscaped lawn, which is ideal for your wedding cocktail party.